Alainn Murphy's father is hired on to create an AI for the reclusive billionaire Lorccan Garbhan, and he created the Rose model in Alainn's image. There are some flaws with the AI and the design, and her father isn't being given more time to perfect it. In order to ensure that he isn't sent to prison for fraud, Alainn takes the place of the robot. She is isolated in Lorccan's tower, away from living things and windows, as he is scarred and has a poor immune system. At first, she is scared of the situation, but gradually comes to love him. 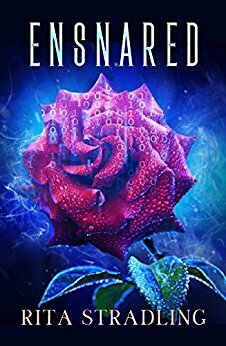 This is a futuristic retelling of the classic Beauty and the Beast story, and I'm always a sucker for rehashing fairy tales. Alainn is a heroine that is very relatable. She makes mistakes, can be impulsive, and cares a lot about her family. It's why she agreed to the robot's plan to go to Lorccan's tower, but that same ability to care for others means that she starts to care for him as well. The romance itself is a slow developing one, which is far more believable in this scenario. They're too unsure of each other at first, and it takes months before the relationship turns physical. There are a lot of twists and turns in the story, keeping me in suspense until the end. There are some aspects of Alainn's history that don't directly add to the plot, and seems to be almost a red herring at times. While Rose treated it as a huge "Ah ha!" moment, it isn't as big a part of her characterization as it's made out to be. Maybe that's the point of it, though; Rose uses calculations and formulae to predict human behavior and emotions, but falls short. We're not so easy to predict, and even "knowing" someone or their history doesn't guarantee outcomes. People need human contact and companionship, and there is no replacing the human spirit.